Every time I drive up to my house I sigh just a little. My neighbors have gorgeous flowers out in their yards – pots and plants and bushes – while I have seven hundred bikes, trikes, and scooters scattered across my yard. I’m not so good with flowers – you actually have to pay attention to them occasionally and give them water and all. I think I’ve killed every houseplant I’ve ever owned. So I’ve been loving all the paper flowers I’ve seen cropping up across the internet – I can’t believe how gorgeous and realistic many of them look. Plus I gotta say I really like the idea of beautiful blooms that will stay pretty for months with no extra effort required. 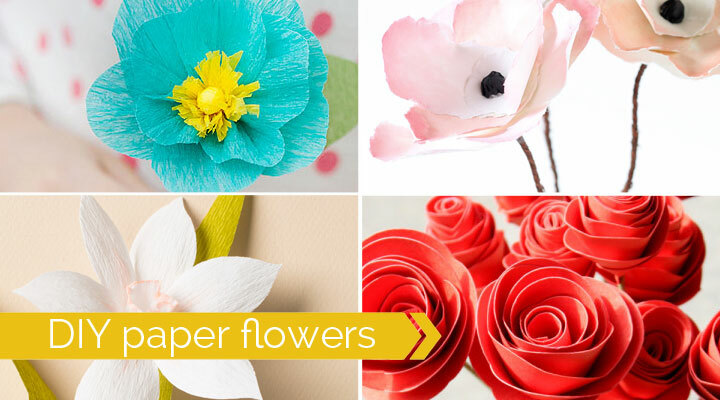 I’ve gathered up 20 of my favorite DIY paper flower tutorials here – some are so easy they’d make a great kid’s craft, while others are a little more involved. Many of them would be PERFECT decorations for weddings! 1. 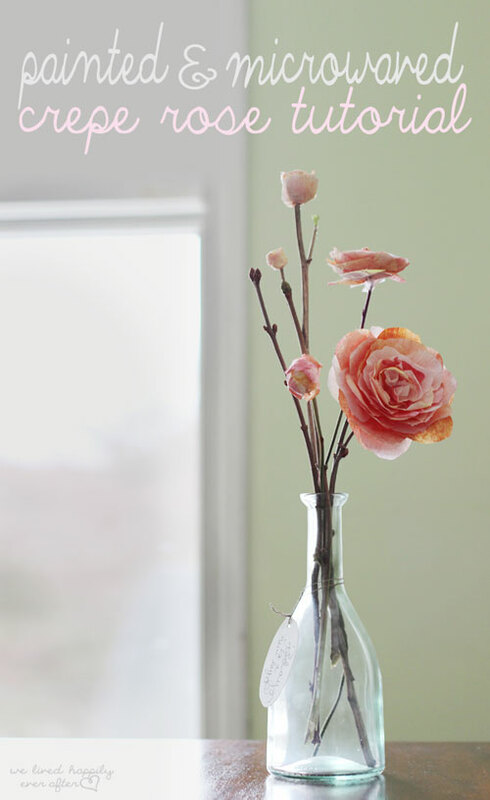 These modern rolled flowers look super easy and quick enough to put together a whole bunch. From The Casual Craftlete. 2. 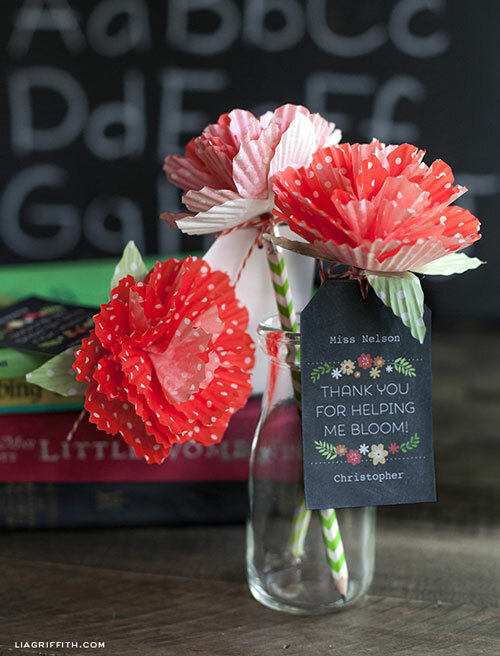 Cute polka flowers from Lia Griffiths via Skip To My Lou start with cupcake liners and a pencil. 3. 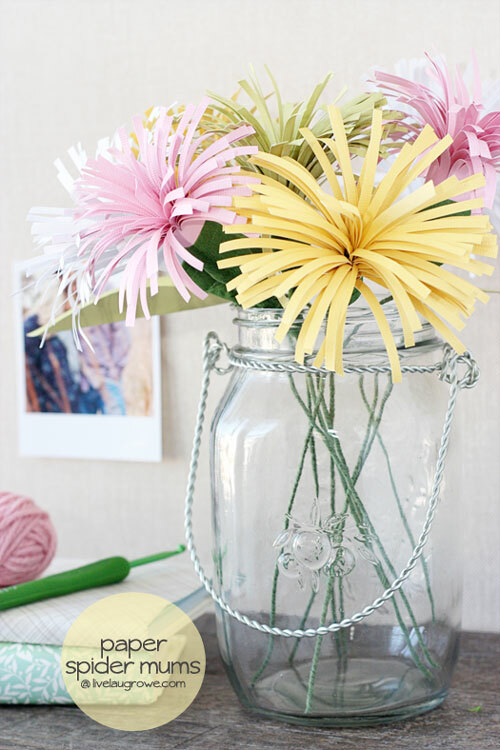 These paper spider mums from Live Laugh Rowe look easy enough for kids to help make! 4. This paper rose from We Lived Happily Ever After is incredibly realistic looking – the process is a little more involved than some of the other tutorials but the results are stunning. 5. 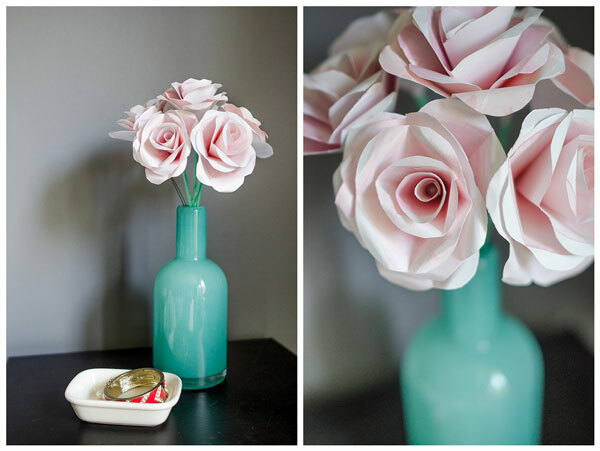 For an easy version of paper roses, try these from Capitol Romance. 6. 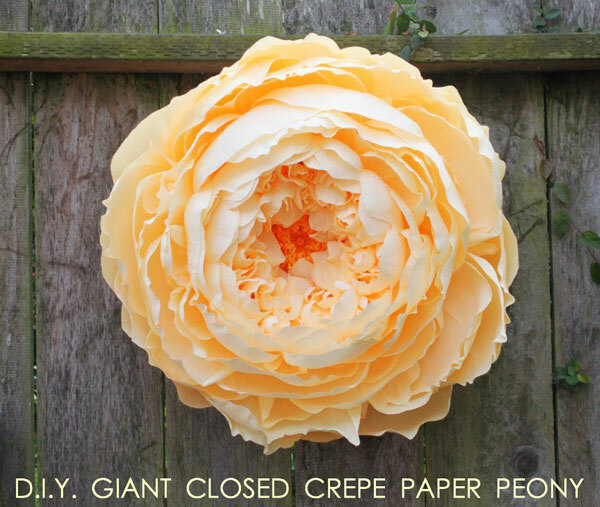 This giant crepe paper peony designed by Corner Blog is truly a work of art! 7. 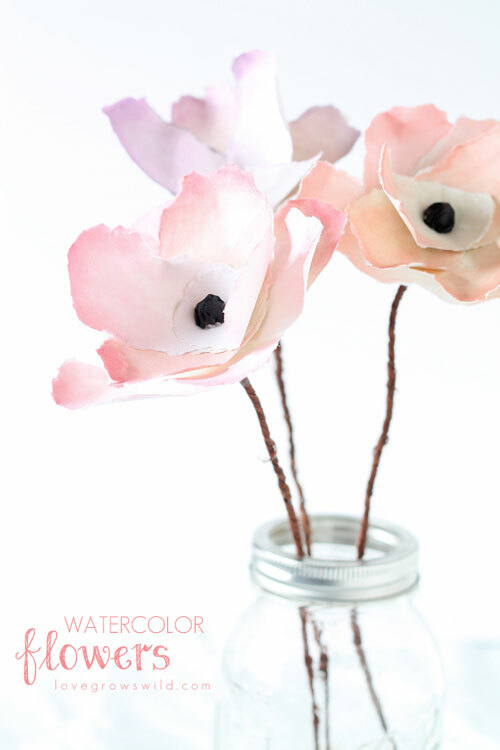 These pretty watercolor flowers from Love Grows Wild could be made with watercolors or spray ink. 8. 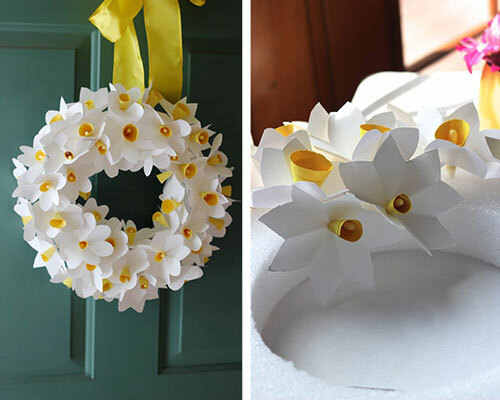 This daffodil wreath Classic Play is designed to be easy enough for kids. 9. 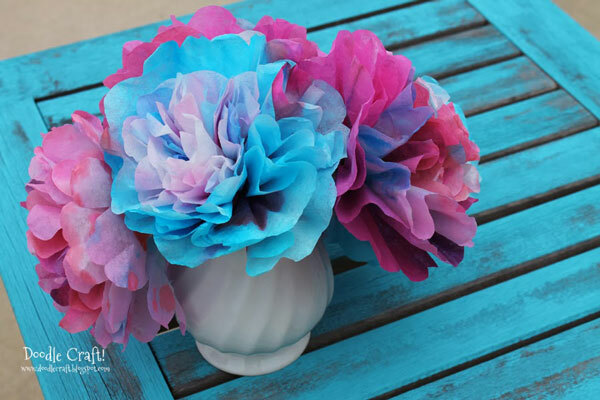 Doodlecraft shows you how to make bright, colorful flowers using coffee filters and food coloring. 11. 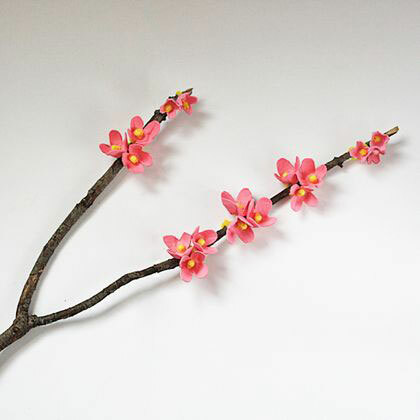 This pretty cherry branch is made using egg cartons! From Spoonful. 12. 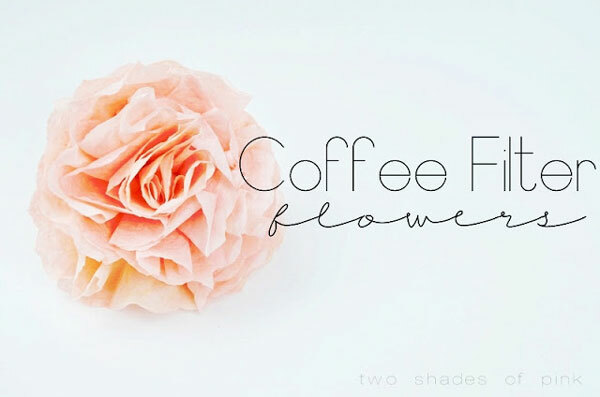 Two Shades of Pink shares a video tutorial for these coffeee filter flowers. 13. 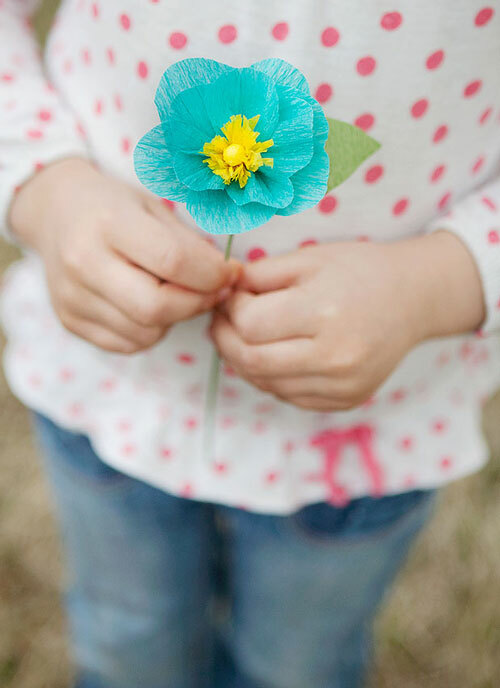 I love the unexpected color combination in this simple crepe paper flower by Simple As That via The Art of Simple. 14. 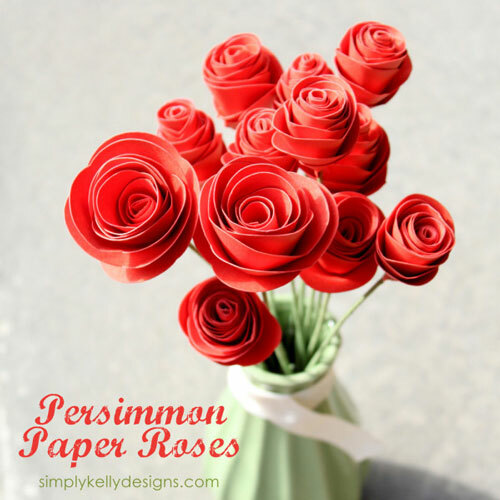 These paper roses are made simple with a Silhouette cut file. From Simply Kelly Designs. 15. 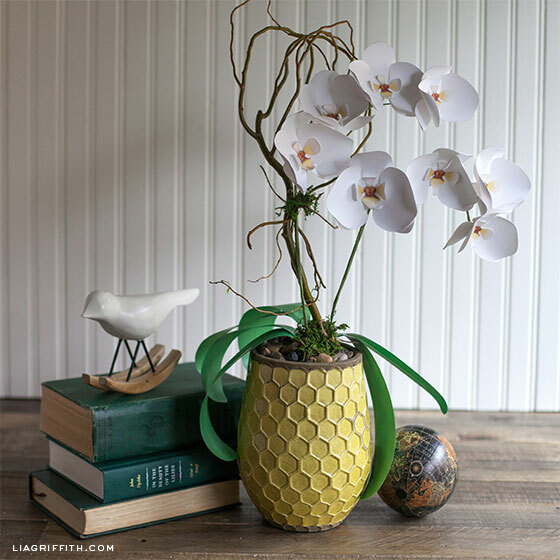 This paper orchid from Lia Griffith comes with a printable template. 16. 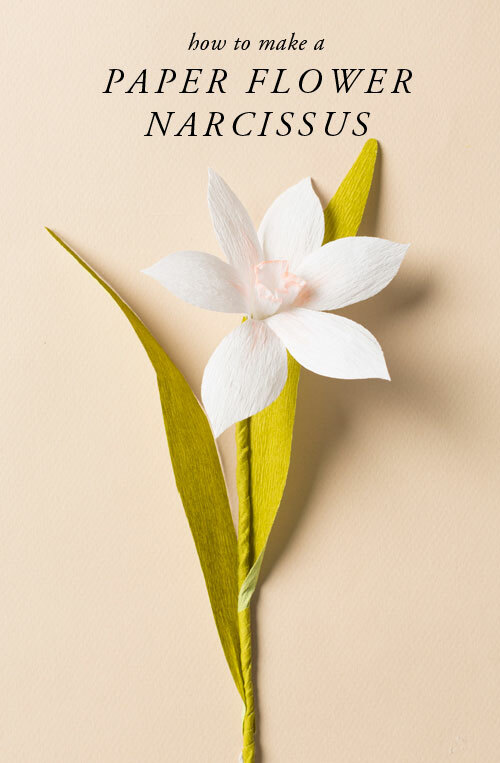 This delicate narcissus is made simple with a free template from The House That Lars Built. 17. 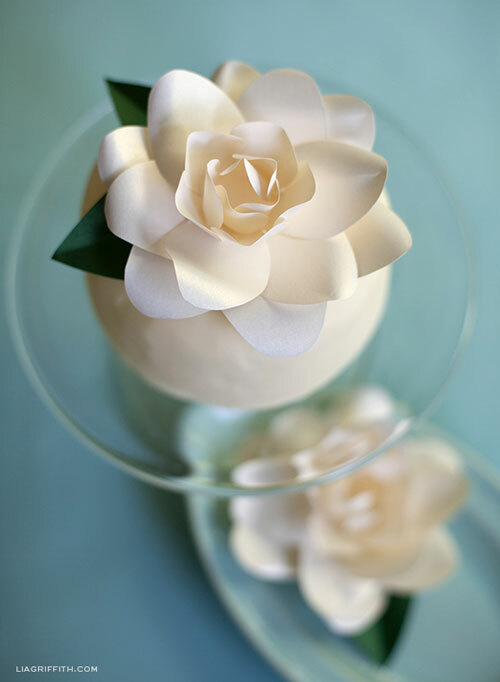 Another beauty from Lia Griffith: a paper gardenia. 18. 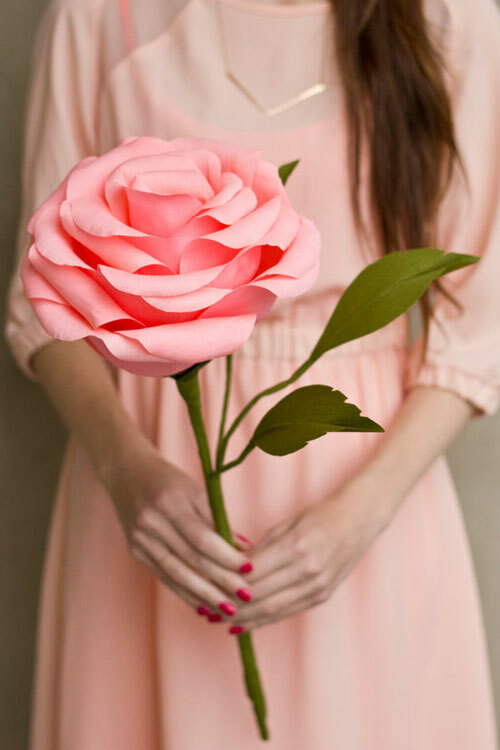 Studio DIY has a great tutorial for making giant crepe paper roses using a template available from Martha Stewart. 20. 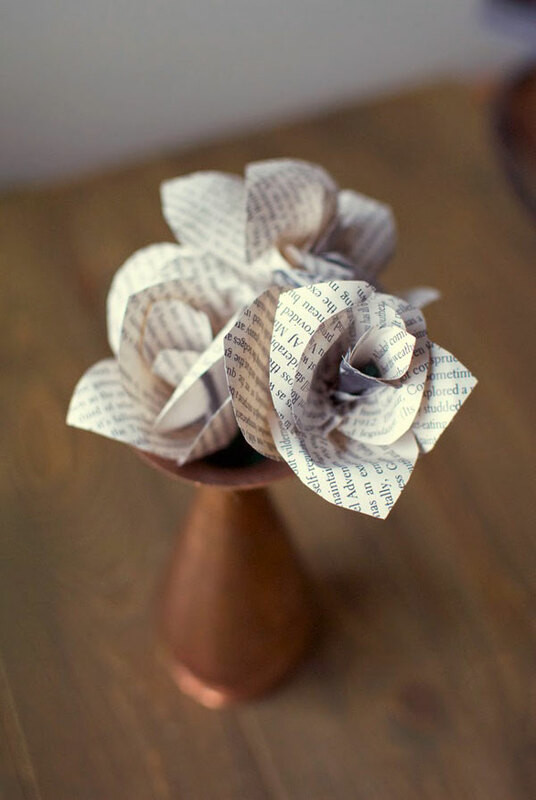 I LOVE the look of these book paper flowers from Tiny Painter. Ok, I couldn’t stop at 20, so here are two more! 21. 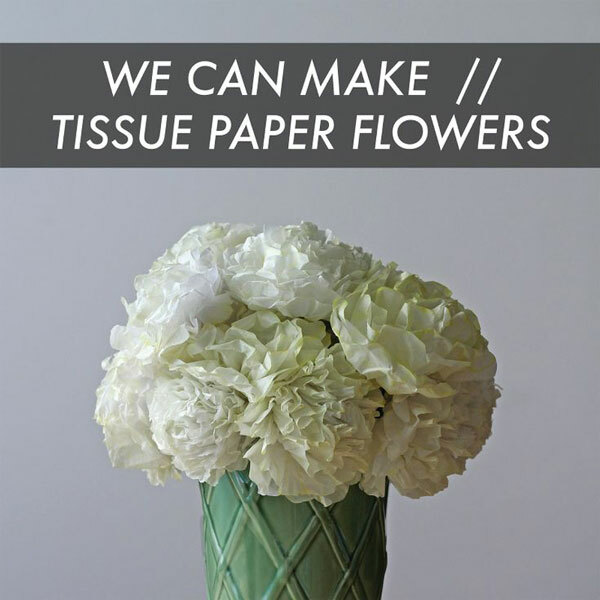 These flowers from We Can Make Anything are made with tissue paper instead of crepe paper (easier to find and more affordable). Moving gifs make this tutorial super easy to follow! 22. 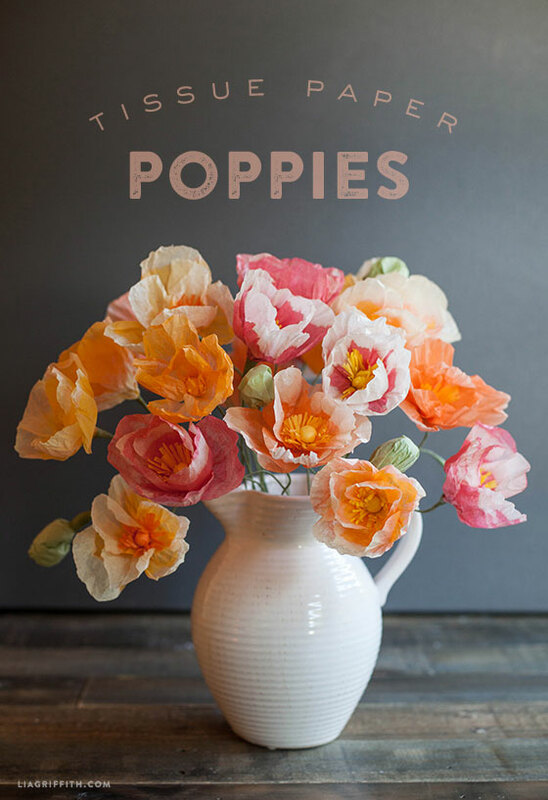 These tissue paper poppies from Lia Griffith get their pretty variegated color from bleach! So gorgeous, right? Sounds like a great project for a girl’s craft night – which one do you like best? « different types of knit fabric EXPLAINED + a fabric giveaway! The last one is my favorite…I’m a sucker for poppies! I’m glad I’m not the only one whose yard is landscaped to perfection with bikes, scooters, toys, etc. All I can say that I love those poppies too! And yet you reply? Negatively. I hope you find happiness so you can let others be themselves. When you are happy with yourself you will not feel the need to be so mean. Hurting people hurt people. I hope you look within and find happiness. So where are the tutorials!? How do I make these? Where are the supplies!? Where are the links? This is a tease! I am very impressed with your website. I really love these flowers 🙂 thanks for having the time to share all of these. Those are really pretty and well done. I love the roses and the giant rose is pretty. I love the paper flowers!!! I just started blogging and I am really impressed with your creative blog!! Great job!! These are great! Thanks for sharing. I am wanting to make some that could stay outside. I’m investigating what kinds of sealers/hardeners I could use. Someone suggested paverpol and then I saw Blair spray clear gloss which looked interesting. Have you ever sealed your flowers? What an awesome idea. Thank you so much for sharing. The paper Narcissus looks so delicate and real! Ow I love them all! Nice rose, those are really pretty and well done. I love the roses and the giant rose is pretty. You are my favorite blog.Keep it up. wow, the beautiful flowers, many colors, I also want to try to decorate my living room, thank you for sharing the way. I want to say is that. We face various problems while watching the game, so we have different problems to watch live games. I’m looking for a site. It’s really great that all types of games are shown live like NFL NHL SOCCER NBA etc. I am linking to a site, you can visit. Just visit this site or Search ” NFLQHDTV ” .. So beautiful paper art, Love them! Awesome crafts ! 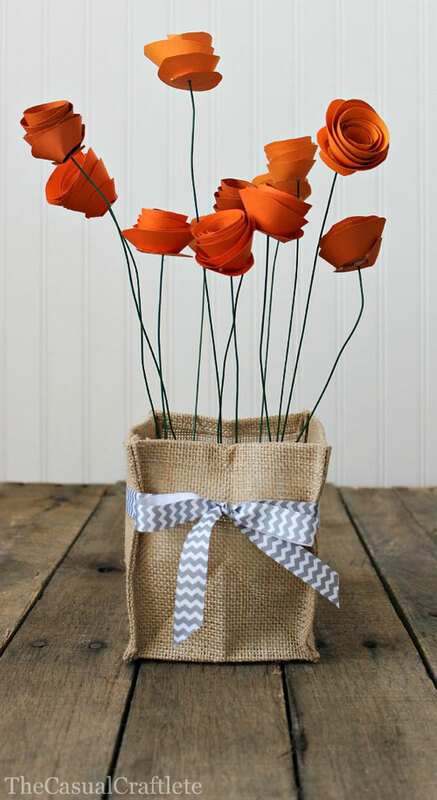 you have made almost all kind of flowers and used so beautiful flower making ideas. These are awesome!!! Thank you… now all I have to do is (try) to choose witch flowers I prefer and make them (not an easy task) hehe 🙂 Thanks for all of these!!! What an fantstic blog amazing good work very informative keep posting like this thanks. 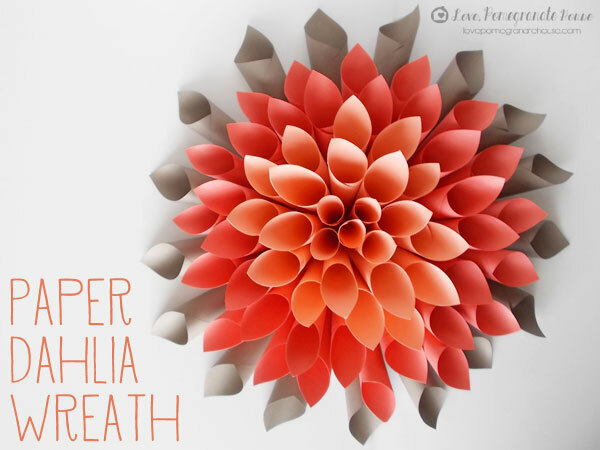 One of the best article on DIY paper crafts and imagery is really awesome. We also love DIY and crafting. We have introduced a unique & fun DIY flower design kit for kids which promotes parent-child bonding, boosts self-confidence in child and encourages creativity. you actually have to pay attention to them occasionally and give them water and all. I think I’ve killed every houseplant I’ve ever owned. So I’ve been loving all the paper flowers I’ve seen cropping up across the internet – I can’t believe how gorgeous and realistic many of them look. Plus I gotta say I really like the idea of beautiful blooms that will stay pretty for months with no extra effort required.